This product requires the base game Redout: Enhanced Edition. 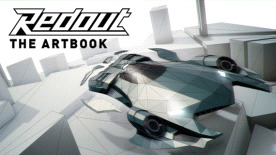 The official Redout Artbook, an in-depth look behind the scenes of the fastest racing game ever made. Find out more about the legendary Solar Redout Racing League; see the Redout beautiful landscapes as never before, with hundreds of preparatory sketches and unpublished concepts. Go explore in detail how the racetracks were assembled, and retrace the steps that determined their final in-game look; examine the Redout ships and see how they evolved from the initial prototypes. And finally, look under the hood and learn more about the shading tech behind Redout's distinct low-poly graphical style. A visually stunning journey 200+ pages long, carefully assembled by recollecting and selecting bits and pieces of the huge amount of work that went into Redout, fuelled by passion for games and love for what we do. This content requires the base game Redout: Enhanced Edition in order to play.